Lean Advisors has provided ongoing support to the Saskatchewan Assessment Management Agency (SAMA) throughout their successful Lean Transformation. SAMA is an independent agency with responsibility to the Province of Saskatchewan, the local governments (municipalities) and property owners. They develop and maintain the province’s assessment policies, standards and procedures, audit assessments, review / confirm municipal assessment rolls, and provide property valuation services to local governments (municipalities). Lean is a journey of continuous improvement and throughout their journey, Lean Advisors has introduced Lean thinking and applications at the day to day operational level through Enterprise Value Stream Mapping as well as at the strategic, business planning level through Hoshin Planning. That enterprise level of commitment is delivering results in terms of improved efficiency, productivity, staff engagement and most importantly with increased client satisfaction. In 2008, The Saskatchewan Assessment Management Agency (SAMA) adopted the Lean business process improvement strategy. SAMA is responsible for the governance of the overall assessment system in Saskatchewan, and the provision of assessment services to our 756 client municipalities. The Agency provides a financial foundation for municipalities and the education sector that they can use to establish and sustain local programs and services. Lean is aimed at engaging the talents of the Agency’s people to eliminate waste, and create value for our customers. With an ever-increasing workload and limited resources, Lean helps to ensure that SAMA’s clients’ and stakeholders’ needs are successfully met. Thanks to the commitment of staff and Senior Management, SAMA is involving people throughout the Agency to tackle some of the challenges affecting the property assessment system in Saskatchewan. Because the Agency looks for input from staff and management in all eight of our regional offices across the province, as well as our central office in Regina, the Agency has opted to train all staff and managers in Lean processes. Staff all receive Introduction to Lean training, and many staff have received further training in Lean processes and change management. The Agency currently has 14 certified Green Belts, and 5 certified Black Belts. There are an additional four certified Green Belts who are currently Black Belt candidates, as well as another 14 Green Belt candidates. Six of SAMA’s Executives have also completed Green Belt training. To help guide and steer the Agency’s Lean journey, SAMA uses value stream mapping to improve the Lean process. One of these improvements was to develop a Lean Manual. The manual outlines details on creating and managing value streams, organizing and executing Rapid Improvement Events and the roles and responsibilities of staff, value stream leaders, facilitators and others. All staff can access the manual on SAMA’s intranet system. SAMA currently has several value stream maps in progress representing the different areas of focus within the Agency. For the operations area (Assessment Services) SAMA has value streams for Data Verification, Revaluation, Support of Value and Industrial Assessments. For the Agency’s support divisions SAMA has value streams for Revaluation Governance, Finance, Quality Assurance, Human Resources and Agency Planning. An Agency in a much better position to meet the increasing demands from clients. 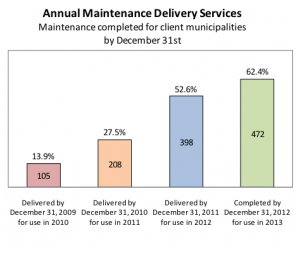 Advanced the Agency’s annual property maintenance program by 3-4 months and in 2012 completed the work for 62% of our client municipalities by December 31st. In comparison, only 14% of client municipalities received their annual property maintenance by December 31st in 2009. Property maintenance occurs when municipalities request SAMA to do on-site inspections of specific individual properties, usually where significant developments or changes have been made that have altered the physical data on a property. 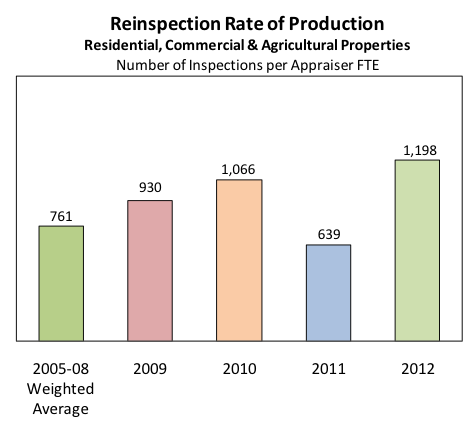 Increased property reinspection productivity 57% over four years from 761 properties per appraiser Full Time Equivalent (FTE) in 2008 to 1,198 properties per appraiser FTE in 2012. Periodically, municipalities must have all their properties reinspected on-site to verify that physical data and valuations are accurate. Increase the number of properties that an appraiser can review by 80% from 1,029 to 1,850 properties annually using Lean business process and technology improvements. 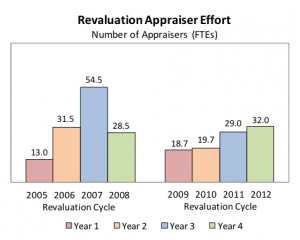 Double the number of properties that an appraiser can reinspect from 1,050 to 2,100 properties annually using Lean business process and technology improvements. Utilize Lean value-stream mapping events and other tools to increase the efficiency and effectiveness of work processes. 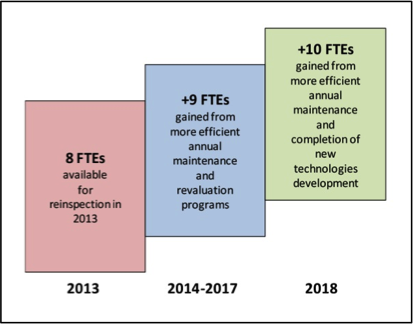 Improve the efficiency and productivity of annual maintenance processes resulting in the reallocation of 14 FTEs to the property reinspection program by 2018. Based on continued significant growth expected in Saskatchewan’s energy and minerals sectors, the agency will progressively double the capacity of our industrial program by 2017. 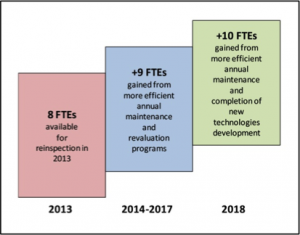 Lean process improvements, software upgrades, cost model simplification and remote data collection tablets will improve the efficiency of the industrial property assessment program by 25%. 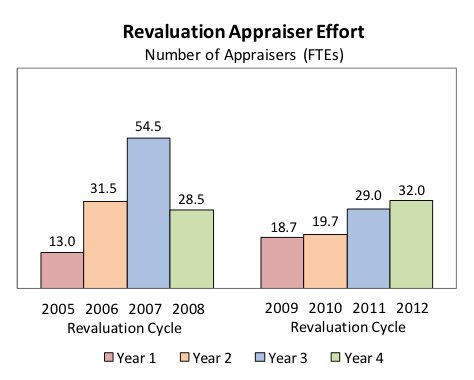 Efficiencies will be attained in delivery of the revaluation and annual maintenance programs that will allow the reassignment of critical appraiser resources to the reinspection program – increasing the agency’s average capacity for reinspections from 8 FTEs in 2013 to 27 FTEs annually by 2018. The agency will continue to build on the Lean improvements attained over the past five years. The plan takes a long term and careful approach to innovative new business processes, and it invests in technology to ensure the sustainability of the property assessment base and municipal and education property tax revenues. The focus for 2014-17 will be on sustaining current levels of service for our governance responsibilities, continuing to improve the delivery of assessment valuation services to our clients, and building the capacity to enable the Agency to reinspect all properties at least once every 12 years. SAMA’s Lean journey has been one of trial and error and learning from our missteps. The Agency’s Lean transformation has required this learning process, which will ultimately help us move towards becoming a truly Lean organization. With a strong commitment and growing knowledge of Lean, SAMA is constantly looking for ways that Lean can influence and improve our everyday business, and in turn, help us provide our customers with the best service possible.